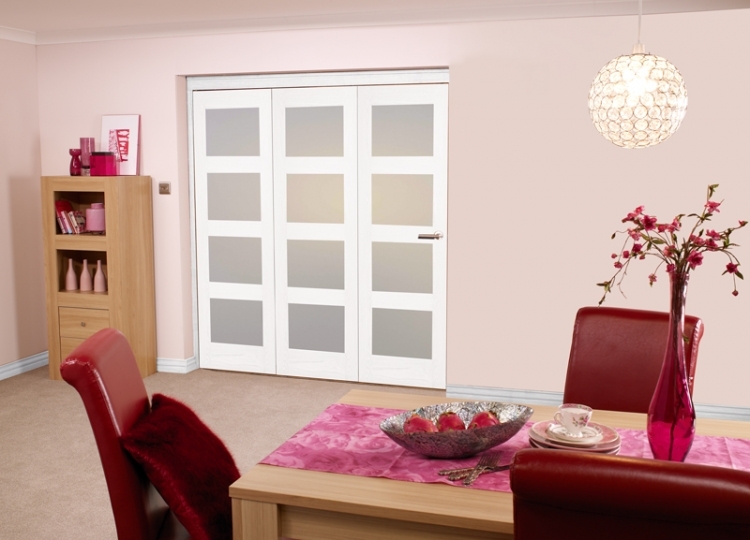 If you like the idea of having glazed folding doors in your home, but would like a touch more privacy then the frosted glass fitted in these white primed 4 light Shaker style doors is the perfect compromise. The frosted panels still allow plenty of light to filter through whilst obscuring the view through to the other side. We have found these internal bifold doors to be a very popular choice for new builds, renovations and refurbishments alike. Some of our customers have even been so impressed with the quality of the primer that they’ve installed the doors as they are, with no further decoration. Operating on a top-hung system, these doors are very easy to install by following the instructions supplied with the frame pack which includes the primed doors, unfinished frame, hinges, head track and running hardware. However we do not supply the handles or drop bolts as we know it’s important to match those to the existing ironmongery in your room. So, take a look at our available options below and choose your perfect set today. If you require any assistance, or just a helping hand, then don’t hesitate to give our friendly and knowledgeable team a call on 01332 897 185. We’re happy to help!